I’m going to have to science the s–t out of this. Space travel is having a moment. After decades of waning public interest and a carousel of feature films that only feature the worst of what space has to offer, a trio of releases in the last 12 months have started to turn the tide. Interstellar captured the wonder of infinite space through its incredible visual effects. Tomorrowland, while not without other problems, was at its heart about optimism, innovation, and reaching for the impossible. Now, just weeks after the world cheered to the first images of Pluto — and just months after the European Philae probe successfully landed on a speeding comet — it seems like we’re ready once again to look up, and out, in curiosity. That means it’s the perfect time for The Martian. NASA knows this, and very smartly collaborated with 20th Century Fox on the marketing for the film: web articles about the technology, panels featuring the cast and the novel’s author Andy Weir, even an “educational” video about the mission depicted in the film presented by cosmologist emeritus Neil DeGrasse Tyson — in short, they’ve pulled out all the stops. Some have even accused NASA of shamelessly waiting until the week of the film’s release to coincidentally announce that Mars has water. Myself, I think that’s great. Anything that gets people excited about space travel is great. And if The Martian is as big a box office success as it’s tracking to be, there should be an entire generation of young people whose minds have been captured by it, and the ingenuity, camaraderie, and creativity it depicts. Imagine the famous “steely-eyed missile men” sequence of Apollo 13 — “we’ve got to find a way to make this fit into the hole for this using nothing but that” — but as an entire movie. Watching likable people solve problems is genuinely fun, and an intellectual thrill. Director Ridley Scott, who frankly hasn’t made a great movie since the Director’s Cut of 2005’s Kingdom of Heaven, is smart enough to recognize that a huge part of the compulsively readable novel’s success was its tone. Stranded astronaut Mark Watney, as written, isn’t just doggedly persistent, but doggedly good-natured. He loves bad puns and pop culture and will call himself the first “space pirate.” That’s not so far off from reality, as NASA makes sense of humor a priority when selecting astronauts — how else are you going to stay sane for months on end, whether orbiting Earth in a space station or landing millions of miles away? There was some concern when the film went into development that the combination of the famously dour Scott with lead actor Matt Damon, who lately has just been taking “serious” roles (including last year’s Interstellar, where he basically played the same kind of part, but as a bad guy) would whiff on the novel’s humor entirely. Thankfully, we needn’t have worried. Not only is The Martian Scott’s best film in a decade, but likely the funniest in his entire catalog. On entertainment value alone, it deserves to be a hit. And thanks to strong performances, seamless effects, remarkably controlled pacing, and sure-handed direction, I’m willing to call it a classic. In the early scenes we meet the crew of the Ares III, mankind’s third mission to the red planet, as they crack wise and dig around in the dirt. Commander Lewis (Jessica Chastain) keeps them on task. Martinez (Michael Peña) pilots the ship. Beck (Sebastian Stan), Johanssen (Kate Mara), and Vogel (Aksel Hennie) do stuff. And then there’s Mark Watney, the botanist. When a sudden storm leads to a mission abort, Watney gets taken out by a piece of equipment in the chaotic trip back to their rocket. The others have no choice but to lift off, believing him dead. Obviously, he’s not. But the fun comes over the next two hours, as Watney makes his way back to the base (or the HAB), yanks a piece of metal out of his belly, and goes about the business of surviving on Mars until someone can come back to get him…which may take a year, or longer. Damon is in peak Everyman mode, whether snarking to one of the many cameras around him about his plight (with no clue whether anyone will ever see it), or reacting exactly as we would whenever something goes wrong. And boy, do things go wrong. As he MacGyvers his way forward, repurposing solar panels, using a piece of radioactive equipment for warmth, and growing potatoes on his living room floor (fertilized with his own waste! ), Watney is the ultimate brainy protagonist, and a delight to watch in every scene. There’s no deflated volleyball to talk to, but he does have a seemingly endless supply of Commander Lewis’s terrible disco music. And once NASA discovers what’s going on, introducing a new handful of characters, things really start to get fun. When Watney finally figures out how to communicate with the folks back home, it’s only minutes before a technician realizes what he’s up to, and the cross-cutting that results is emotionally satisfying, and exciting in its own way. This cast is ridiculously stacked — there are ringers around every corner. Jeff Daniels. Kristen Wiig. Sean Bean (who got the biggest laugh in the theater with a well-timed reference to his previous work). Halt and Catch Fire’s Mackenzie Davis. Community’s Donald Glover. Chiwetel F-ing Ejiofor. And each one of them, including the astronauts on Watney’s Hermes, gets multiple moments to shine. The screenplay from Drew Goddard is remarkably economical, even given the film’s 141-minute run time. There may be a lot of hard science jargon to interpret, but the characters are revealed through their natural interplay, not massive exposition dumps. The pacing never flags, thanks to Scott’s longtime editor Pietro Scalia. There’s no unnecessary melodrama: only practical solutions. It’s a smooth, polished, fist-pumping ride. Even though it’s set in the near future, The Martian manages to speak to where we are right now culturally. It has an optimistic, we’re-all-in-this-together ethos that seems straight out of Star Trek, where nations that might usually have a frosty relationship pool their resources and their brightest minds to for once do the right thing. While that might seem more fantastical than sending people to Mars in the first place, it rings true within the NASA community. Yes, it will cost untold billions to rescue Mark Watney, but if they succeed, there’s no greater testament to human determination and inventiveness. Why don’t we as Americans focus more on what we can do — in science, in social issues — instead of regurgitating the same tired reasons for why we shouldn’t bother to try? Filming the Martian exteriors in Wadi Rum, Jordan, gives those scenes a credible other-wordly feel. There’s no shortage of CGI work, of course — not just with the spaceships, but in the backgrounds — and it seems we’re reaching a watershed moment in how directors like Scott use the technology. So much of the best work I’ve seen this year, like in Mad Max: Fury Road or more recently in Everest, is almost invisible. 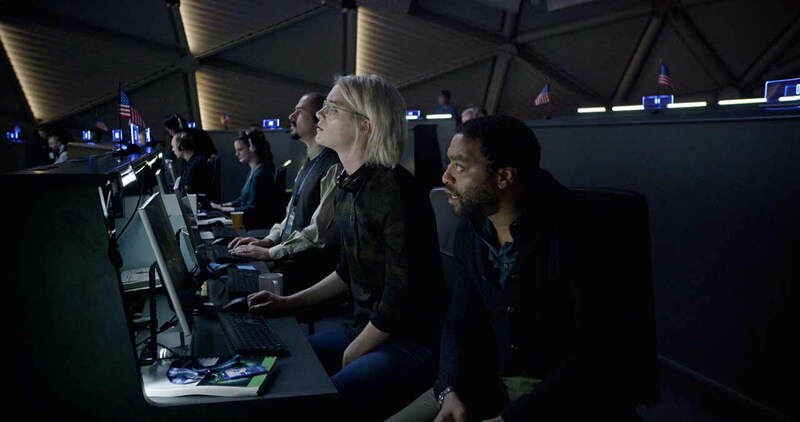 The computer is simply a tool to be used in conjunction with real locations and practical props, which is exactly how it should be — the Martian landscape, in all its vastness, is never less than convincing. It’s truly transporting in a way that glossy modern blockbusters rarely are. And even if it wasn’t, we’d probably buy it anyway because of the clever script and committed performances from Damon and the others. Ultimately, this is a rare example of everything coming together just right: a lovingly crafted, incredibly smart film that gives absolutely no indication of how tricky it was to pull off. The 77(! )-year-old Scott makes it look so easy, you have to ask why he’s been letting himself slum it for this long. The Martian is, right now, my favorite film of 2015.